Are you ready to be sheriff in your town? All future law enforcement officers will get in line for this vibrant Police Car jumper. This jumper provides 170 square feet of pure bounce, with the realistic squad car keeping watch overhead. The design shows three-dimensional side-view mirrors and the top band of police lights. A uniformed officer can be seen sitting inside, and a gold sheriff's symbol lets kids know this is the real deal. The Police Car jumper is a great way to promote civic duty and entertaining exercise. 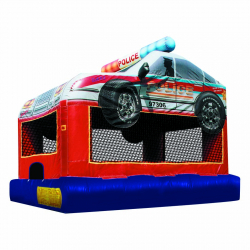 The bounce house is the perfect way to combine fun and healthy activity, and will add value to any party.